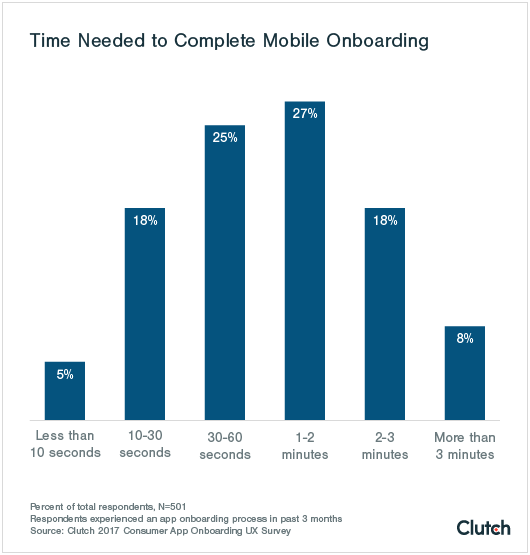 When it comes to app onboarding, users want clarity, security, and ease – and they want it in 60 seconds or less, according to Clutch’s new survey. Clutch walks you through how to achieve those characteristics in five attainable steps. Competition for every mobile app user’s attention is fierce. An efficient and reliable onboarding process can help your user retention rate by giving users a positive impression of your app right away. How do you achieve efficient and reliable onboarding, though? Clutch set out to answer that question by surveying 501 individuals who installed and used an app that asked them to complete a profile, account, and/or tutorial (that is, an onboarding process) within the past 3 months. Based on our findings, here are five ways to improve your mobile app’s user onboarding process, whether you’re a developer, a UX/UI designer, or a company working with a firm to create an app. These practices will encourage users to open your mobile app day after day. 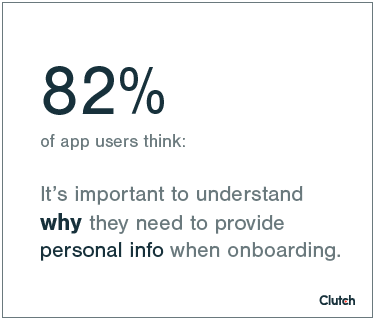 Nearly three-quarters (72%) of respondents thought the app onboarding process should take 60 seconds or less. The more time participants had to spend providing information, the more frustrated they became. 44% of respondents downloaded an app “for fun,” making that the most popular reason. Four-fifths (82%) of users said that they wanted clear reasons behind apps’ information requests. 76% of respondents indicated that the safety of their personal information was very important. Each time you use a device or application for the first time, you get onboarded: You fill out forms and complete tutorials. But onboarding isn’t only about form blanks. In other words, onboarding refers to the entire orientation process and takes into account what the app user wants to achieve, not just the product designers. Since the majority of mobile apps require some form of onboarding, understanding the larger picture of new user acclimation is key. Potential app users are spoiled for choice, so companies must convince people of their app’s usefulness from the first possible moment. That’s where the value proposition comes in. Almost three-quarters of respondents (72%) said completing all onboarding steps in less than a minute is important in their decision to keep using that app. One minute may not seem like much time, but consider the sheer volume of available mobile applications. According to Statista, 2.2 million apps were available on the Apple App Store in March of 2017, and that number increased to 2.8 million in Google Play. An app has to appear enticing in order for users to download it. “The biggest mistake [a designer] can make is to not articulate the value to the user,” said Jordan DeVries, director of UX at UX/UI firm Brave UX. An immediate value proposition tells users why they should sign up for your app. If UX designers do this right, they can hook users into completing the rest of the onboarding process. Jenna Godfrey, a UX designer at Brave, noted that the news app Flipboard presents the value proposition particularly well. The features Godfrey mentions, like try-as-you-go tasks, capture app users’ attention. 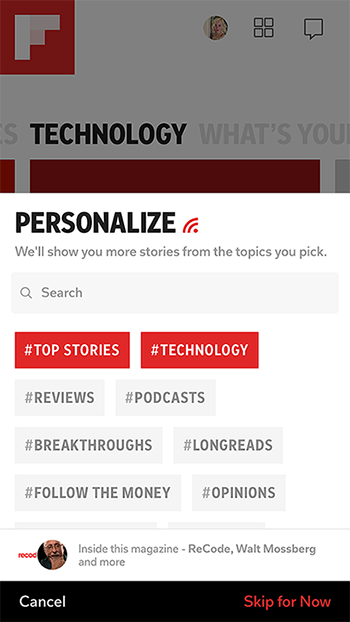 Once users log into Flipboard with a social account, they can select topics and read stories. Flipboard’s value becomes clear in seconds. 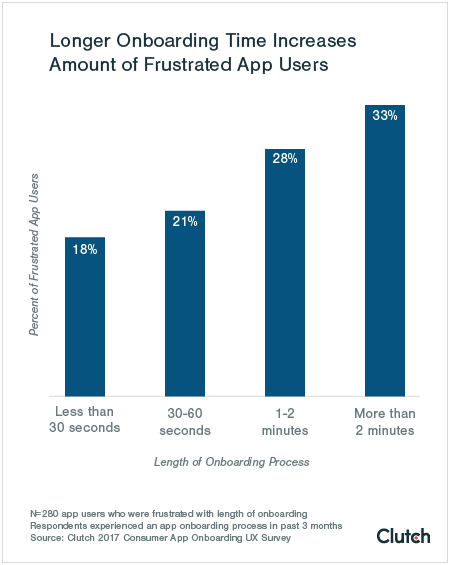 The more frustrated users become during onboarding, the more likely they are to stop using your app. One minute may be an ideal onboarding time, but you have room on both sides. Over half (52%) of respondents said it took them between 30 seconds and 2 minutes to complete the onboarding process. However, users became frustrated as the time needed to complete registration increased. More than 20% of app users were frustrated by a 30- to 60-second process, while 28% were frustrated by a 1- to 2-minute process. When onboarding increased to 2 or more minutes, 1 out of 3 respondents (33%) said they were frustrated. If your users become impatient during a key moment like onboarding, they’re more likely to “churn,” or to stop using your app. Mobile engagement platform Localytics says that 58% of users ditch a new app in the first month, and 75% have churned within three months. In light of those numbers, keep onboarding as short and friendly as you can while giving users incentives to come back. “Sometimes you have the marketing arm of an organization really trying to bolster that leads profile with as much data as possible - phone number, zip code, etc. But you always have to ask: ‘Is it really needed to create the account?’” said Christine Pillsbury, co-founder of design firm altr. Prevent unnecessary steps from piling up by listing your app’s onboarding steps, then cutting anything you can ask for later (see the Scandy example in section 3). There are exceptions to the 3x3 rule. Applications that help with strenuous and data-heavy processes, such as filing taxes, may well need more than two minutes to orient new users. 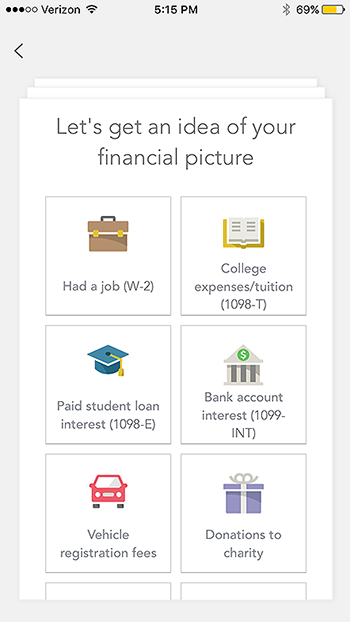 For example, TurboTax asks for in-depth financial documentation moments after a new user creates an account. 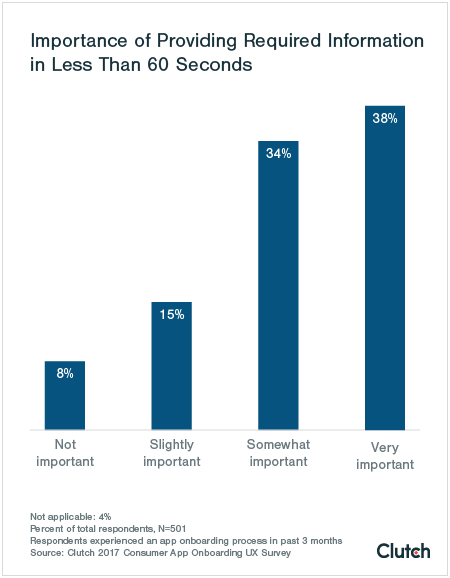 30 seconds, 60 seconds, and 2 minutes are useful benchmarks, then, but they won’t fit the needs of every app. Onboarding tailored to users’ goals is the true objective, no matter how long or short it takes. App users want entertainment and enjoyment, and gamification can help as early as onboarding. Onboarding tone should match your app’s overall tone, so if your app is geared towards leisure or entertainment, keep your onboarding copy fresh and enjoyable. Gamified elements like progress bars, point tallies, and badges/stickers provide an enjoyable tone, not only for leisure-focused apps but for all mobile applications, according to Brave’s Jordan DeVries. “We abandoned the traditional heavy form signup and instead created applications which have a progressive display, or some level of gamification,” said DeVries. 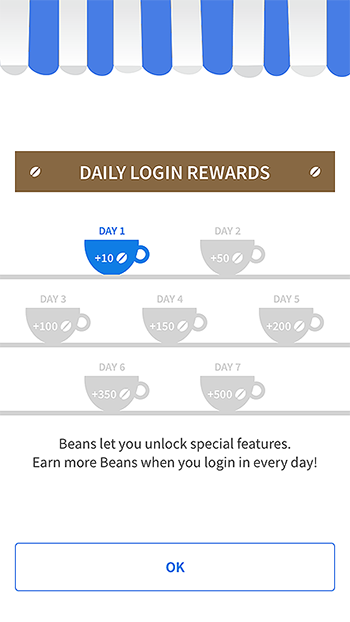 Coffee Meets Bagel, an online dating app, provides users with incentives to keep using the app by giving them ‘coffee beans’ for logging in again after they complete their first session. The more users open the app, the more beans they receive. Coffee beans function as in-app currency, so users can buy more match opportunities or super-likes. By doling out coffee beans just for opening the app, Coffee Meets Bagel makes onboarding an organic, week-long procedure while giving users a reason to return. The app exemplifies gamification done right. Another example of engaging onboarding is Scandy, a 3D scanning app with an onboarding process designed by Clay Global. Dmitry Tsozik, Clay’s design director, explained the difficult onboarding process for a 3D scanning app. “The 3D scanning process is an activity you’re probably not very familiar with. It’s a technical process. You need to understand a lot of concepts,” Tsozik said. Tsozik and his team decided to let users swipe through a few screens of copy when users first open the app. It looks like onboarding, but Tsozik said that, though the information in the copy is helpful, it doesn’t actually matter if users forget it. They can browse the app’s directory of scans, thus seeing Scandy’s value immediately. When users try to scan an object for the first time, the real onboarding begins. By the time users finish the “hidden” onboarding, they understand how to use Scandy. It’s complex onboarding made simple and captivating. Prepare app users for mobile device information requests in order to put your users’ minds at ease. 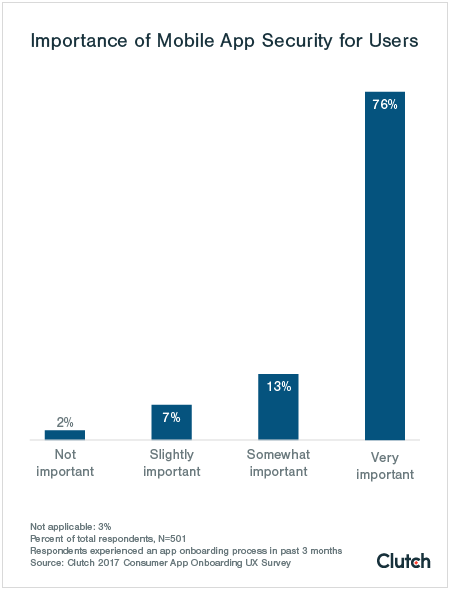 Over four-fifths of users said that clarity behind an app’s personal information requests was important to them. It’s common for an app to request various permissions. For example, map apps require location services, whereas photo apps need access to a camera. Remember that users are increasingly wary about granting all these permissions, though, and information security is becoming a top priority for developers across all platforms. Reece Franklin, the founder of Blink, uses Skype for business purposes. However, the new mobile update for Skype left him feeling uncomfortable. “It requested around eight individual permissions right from square one,” he said. Franklin granted all permissions, but only because the app was created by Microsoft via Skype – two well-known companies. However, his image of both entities was soured. “I trust both companies just a little bit less now,” Franklin said. Getting users to feel comfortable giving permissions is all about “the timeliness of the request,” said Christine Pillsbury. “Are you asking at the right time or did you just walk in on a blind date and say, ‘Let’s get married’?” That is, does your app ask for too much, too fast, or does it cultivate a sense of trust first? Avoid app user discomfort by implementing ‘permission priming:’ demonstrate what your app could do for users if it had the right permissions, then ask. That way, your users have context. 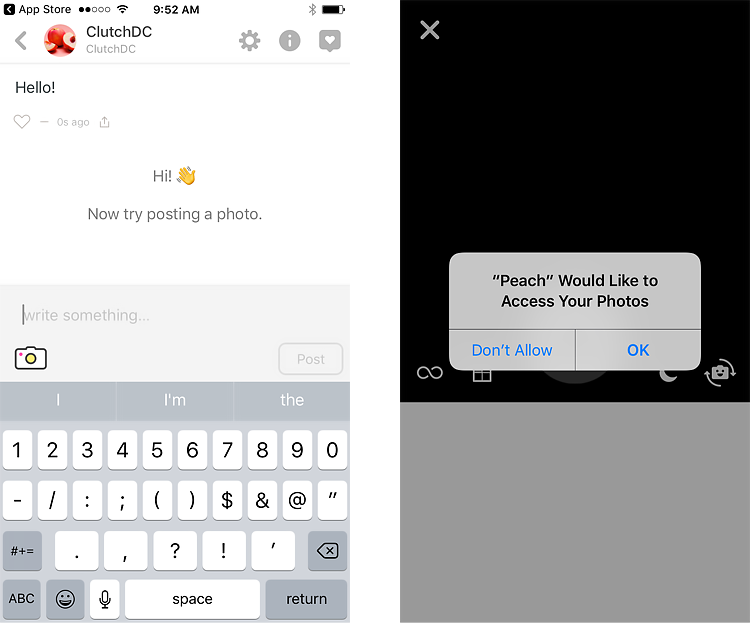 In this example from social networking platform Peach, the app establishes a reason for making a request. The onboarding process invites new users to post a photo but only asks for permission to access the photo gallery once a user has tapped the photo icon. Users are right to be concerned about giving away information included in permissions, according to Tsozik. “I personally am very careful about what to share with apps, and sometimes decide not to use an app at all if it asks for too much information,” he said. In order to win over tech-savvy users like Tsozik, it’s imperative to consider the timing and necessity of permission requests. Security is an absolute must for mobile app users. Nearly 9 out of 10 respondents said that information security was at least somewhat important in their decision to continue using an app, with three-quarters saying it was very important. Permission priming is a great start, but you can do more to gain users’ trust. For example, if you ask users to register an account with their email addresses, assure them through your copy that their information is safe. Emphasizing security is especially important if your app requires sensitive financial information, such as credit cards or bank account numbers, to function. The PayPal app shows users the screen above during onboarding. 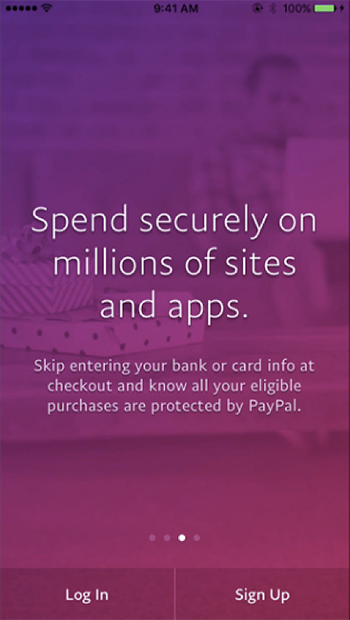 The text assures people that a purchase made through PayPal is both safe and convenient – in other words, users don’t have to sacrifice anything for security. Denys Skrypnyk of The Gradient walked us through the onboarding process of a financial technology app his team recently helped design for a UK-based bank. “Fintech is hard to make simple because of [all the] regulations, policies, and security points,” he said. As a result, The Gradient designed an onboarding process that didn’t require users to provide checking account information. This eliminated many of the hurdles banking apps face during onboarding. “The main point is for [users] to provide their identity,” Skrypnyk said when describing the app’s introductory steps. Not asking for checking account details helped The Gradient create a sense of trust. Although building a secure interface should always be a part of app development, you may not have much control over security protocols if you’re a UX or UI designer. In that case, your job is to make the app look secure. Designers should focus on the appearance of security rather than the hard security details since a clean design and reassuring copy can go a long way towards creating a secure look. User onboarding is a key part of app design. 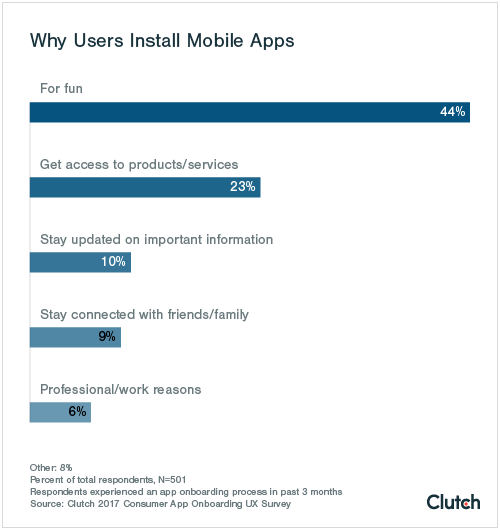 Clutch’s survey results show that app users want a registration process of a minute or less and the more time they spend onboarding, the more frustrated they become. A fast, easy-to-navigate user interface is essential. Furthermore, users download apps so that they can enjoy themselves. An onboarding experience should prime users for the fun they’re about to have by matching an app’s tone. Finally, users are concerned about the information and permissions they give apps. They want to know why they’re sharing information, and they want that information to be secure. The app market is only becoming more competitive, meaning businesses have to optimize every facet of their app’s user interface – especially the onboarding process. The saying “make a good first impression” is just as applicable to mobile apps, and the five suggestions in this article will help your app make the impression you want. The survey respondents consisted of 501 individuals across the United States who have installed and subsequently used an app that required setting up an account within the past 3 months. Exactly half of respondents used the app on an iOS smartphone, while 47% used an Android. The remaining 3% used alternative systems such as Amazon Fire. In regards to gender, 60% of respondents were female and 40% were male.